The Berenstain Bears is one of my favourite book series for young children. I loved them when I was little and my children do as well. 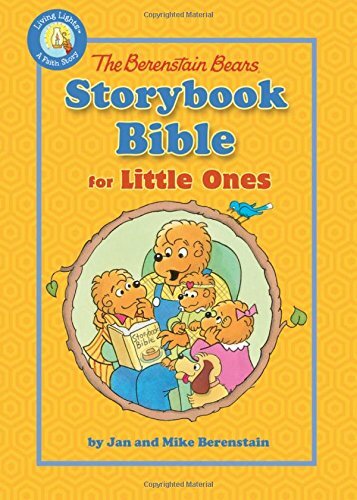 So I was really happy to receive a copy of The Berenstain Bears Storybook Bible For Little Ones by Jan and Mike Berenstain. This is a story Bible designed just for little children. It looks just like the Berenstain Bears books for older children but has thick board pages and a padded cover. The colours are bright and it has simple text. It contains 8 stories, the creation story, Noah’s Ark,David and Goliath, Daniel and the Lion’s Den, the birth of Jesus, the good neighbour, Jesus in Jerusalem and the Easter story. The stories are all told by the bears acting as people. The stories are very short and keep to just the main point. Each one is just a few pages and sentences long. It’s a super cute book for toddlers and preschoolers! When I first took the book out of the package my toddler was soooo very excited! She wanted to look at it right away and loves that she has her own special book. It’s become her favourite book and has been read for many bedtime stories.